SPINALpedia is excited to introduce our newest Ambassador Garrison Redd from Brooklyn, NY! A man with a plan, he was injured at the age of 17 and hasn’t looked back since. At age 30, he is now a motivational speaker and more, and we know he will help a lot of people by example and through his amazing videos. Read his autobiography and make sure to follow him on social media via the links below. 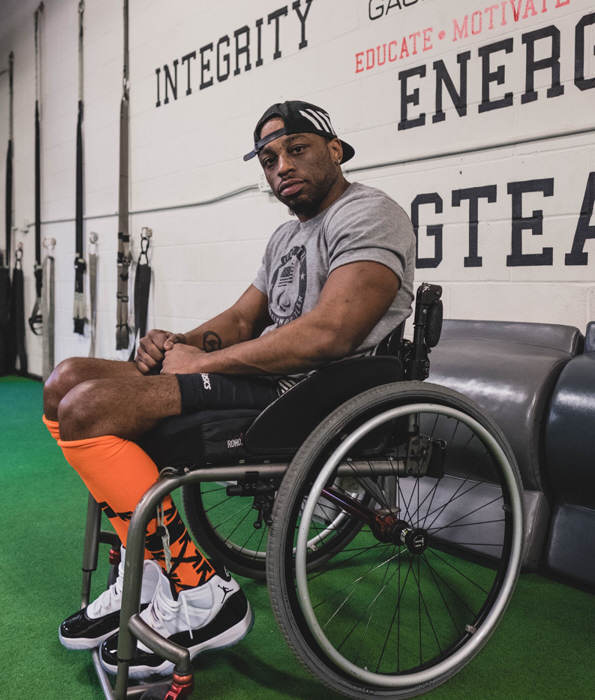 My name is Garrison Redd and I am a motivational speaker, model, athlete/Paralympian, entrepreneur and most of all an advocate for equal rights. I founded an organization called “TheGarrisonReddProject” with an essential goal of bettering the well-being of disabled individuals. We provide free resources and services in the areas of advice, motivation, inspiration, health and other areas in order to improve the quality of living for disabled individuals. I played various sports growing up such as boxing, basketball, baseball, and football. In football, I was a standout running back from youth football up until high school. I received various awards and accolades. Going into my senior year at James Madison High School, I was outside on an ordinary Summer night, when I was shot in my back. The bullet burned the nerves surrounding the T12 section of my spine, which left me unable to walk. Instead of feeling sorry for myself or depressed, I decided to triumph through the face of adversity. Most people would’ve felt that their life was coming to an end, but I felt like my life was just beginning. At 17 years old after this catastrophic injury, I wasn’t discouraged because it made me into a different man. It made me think about the bigger picture. It made me think that I was put here to inspire people of all ages, which I am now on a journey to achieve. Fast forward to present time, I have a bachelor’s degree in Finance from York College. I’m also currently training for Team USA Para-Powerlifting Team with aspirations of winning a Gold medal at the 2020 Olympics in Tokyo. I first became involved in para-powerlifting through competing in wheelchair racing. I am an athlete on the club track and field team the New Jersey Navigators. In May of 2018, my coach entered me into a powerlifting meet. I weighed in at 120 pounds and lifted 250 pounds. At that time I had no prior experience in powerlifting. From there, the performance manager for Team USA contacted me and recommended I compete for a spot on the national team. I also was invited to Colorado Springs Olympic Training Facility to compete in a quick start camp, in which I did very well. I made Team USA in Para-Powerlifting in February of 2019 with a qualifying lift of 273 pounds weighing 126 pounds, in which I was selected to compete in Kazakhstan in July at the Para-Powerlifting World Championships and in Peru in August at the Para-Pan Games. This entry was posted in Uncategorized and tagged garrison redd, spinal cord injury exercise, spinal cord injury speaker, thegarrisonreddproject on April 2, 2019 by Tiffiny.